This month we are highlighting Eglise Evangelique Lons- le- Saunier or the Evangelical Church of Lons Le Saunier associated with CNEF and Assemblies of God. The Jura Department (pop. of 260,502, with the cities Dole and Lons-le-Saunier) historically was part of the “Free County of Burgundy.” After the French Revolution, it became one of the original departments in France, and later became part of the Franche-Comte Region, which is now the Burgundy-Franche Comte Region. This entire area was under occupied Germany in WWII. Three main industries exist within the Jura Department: Cheese, Sunglass Factory & Development, and the wooden toy industry. Top name brands in wooden toys are situated in the Jura. Unemployment as of 3rd quarter 2016 is 7.5%, up 2% from former years. The Jura Center for Apprenticeship and Training serves non-factory based trades such as building, bakery, butchery, hair stylists, and car mechanics. A historic Salt mine exists north of Lons-le-Saunier. Because it is less industrial, it is home to many family owned specialty, artisanal shops, and vineyards. Paul-Emile Victor, worldwide explorer, in the 20th Century. Grass-fed and pasture-raised cows are a breed unique to the Jura Dept (and entire Franche-Comte Region) and provide the specialty cheese Franche-Comté. The Comté cheese is among the top cheeses in France. 57,000 tonnes of Comté cheese is produced annually, all with organically grown cows who are grass-fed without hormones. 7,000 people are employed throughout the region, including the farmers to the cheese production centers throughout the entire Franch-Comte region of both the Jura and the Doub departments. 6% of its cheese is exported to the USA, Canada, Russia, and Japan. Although the Jura Dept. has tremendous beauty, it is surprisingly one of the best kept secrets in France and is not a well-known tourist resort area. Yet its Jura Mountains, rolling hills and vineyards, 20+ lakes and waterfalls, winter skiing sports, hiking and cycling paths, make this a perfect place for a get-away. Its smaller castles overlooking numerous valleys and small villages below add to the peaceful scenery. Lons-Le-Saunier, sits as the capital of the Jura Department. With its surburbs and surrounding villages, population is around 125,876, although one source recorded 17,000 or so for Lons-le-Saunier alone. Although it dates to before Roman times, the entire town was burnt down in the 17th Century. Most all ancient structures were lost, and the roads radiating out from the town square are lined with 17th Century townhouses. A museum boasts the oldest dinosaur bones found in France. The salt mines and springs north of it has made Lons-Le-Saunier a spa center. In spiritual modern day events, in the 1950’s a preacher from Switzerland passed through Lons-le-Saunier and decided the village needed to hear about Jesus Christ and His love. Signs and wonders broke out, with many healings and miracles occurring. He stayed and held meetings in the Paris Café. This opened the way for other churches to begin. The genesis and history of French churches is highly valued. For those interceding, knowing each church’s story can help you to know how to pray for the church. Before the Evangelical Church of Lons-le-Saunier, as stated above, a movement of the Holy Spirit visited this small city when a pastor from Switzerland passed through and felt that he should stay instead of continuing to Paris. This was the early 1950’s. Miracles occurred regularly, including a recorded healing of a woman with MS and another healed from epileptic fits. One of miracles reported was that of God changing water into gasoline for a pastor traveling to the church. With no nearby gas station, he recalled Jesus turning water into wine. In faith, he poured water he had into the gas tank. Then, asked God to change the water into gasoline. He turned the key into the car and it started and took him all the way to Lons-Le-Saunier. In three years, people were driving over 150 kilometers to get to the town- some by car, others by train, and Vespers (motorbikes) because they were hungry for more of God. Eventually in 1957, a first pastor was set in place by the Assemblies of God. Resulting from this outpouring, several other church plants were started in neighboring villages. By 2012, current Pastor Alain Sivasleian and his wife, continue the work begun decades ago. Recent photographs on their website and Facebook pages reflect a growing church reaching out to immigrants and other cultural groups, building bridges between French natural born citizens and those from other nations. This is reflected in their priorities. Evangelism–Reaching out to all those in need, all cultures and nationalities is a key value, and, the congregation aims to do this through the following outreaches. In addition, its obvious that the pastor and his wife have a special gift of hospitality. This extension of kindness is observed throughout their priorities and ministry, knowing that kindness [as shown through hospitality] leads to repentance [Romans 2:4]. Open Table Dinner: In addition to church picnics, the “Open Table” Dinner held every other Friday nights have begun in which different culinary dinners are cooked by other nationalities in their midst. The purpose is to build those bridges culturally to ensure that all are welcomed, to provide a format to meet each other and to understand each other better, to share the gospel of Jesus Christ, and making their church a welcoming and warm environment for all ethnic and people groups. While no list of various nations is given, one dinner served was Thai food, and, through photographs, the church has gathered not just French citizens, but those from African origins and other nations. Pastor Alain values this multi-culturalization of his congregation and shows it through creating this outreach. Bible Distribution: To bring the Word to those who do not yet know Christ personally, the church congregation distributes Bibles throughout Lons-le-Saunier and area towns. Worship and Music Outreaches: Still another outreach is the hosting of concerts, including open air concerts, with Christian Worship Bands. This is done in conjunction with the other churches in the city and with the CNEF churches in the region. Meeting Practical Needs of Others: The church has launched a ministry to serve the food needs and other practical needs of others who are in a time of crisis, hunger, and difficulty. They aim to show the unconditional love of Jesus through these practical acts of kindness. The Youth and Children: Understanding the importance of raising up disciples among the younger generation, the pastor himself has become involved in hikes, picnics, and other events with the youth. The youth meet weekly. The children are equally important and they continue to fashion their children’s and babies ministries. The Word, Worship, and Bible Study and Intercession: The pastor himself is seen leading worship with a multiple of instruments and worshipers, and, weekly Bible Study and times for prayer are held. Webmaster Note: The learning community for French church planters was made possible through a grant facilitated by Impact France. I hesitate to write about my experience over the past few days because my meager words will never do justice to the powerful work that God has begun. I witnessed more holy moments than I could count. I interacted with national denominational leaders who were steeped in grace and humility. I think I may have actually witnessed the place from which a revival in France will be birthed–oh Lord, make it so! As I shift into reporter-mode, hold in your heart a deep and divine anticipation. The description will be sadly lacking in spirit, and it could be easy to read what follows as if it is some sort of strategic plan or human effort. In truth, it is nothing short of a miracle. 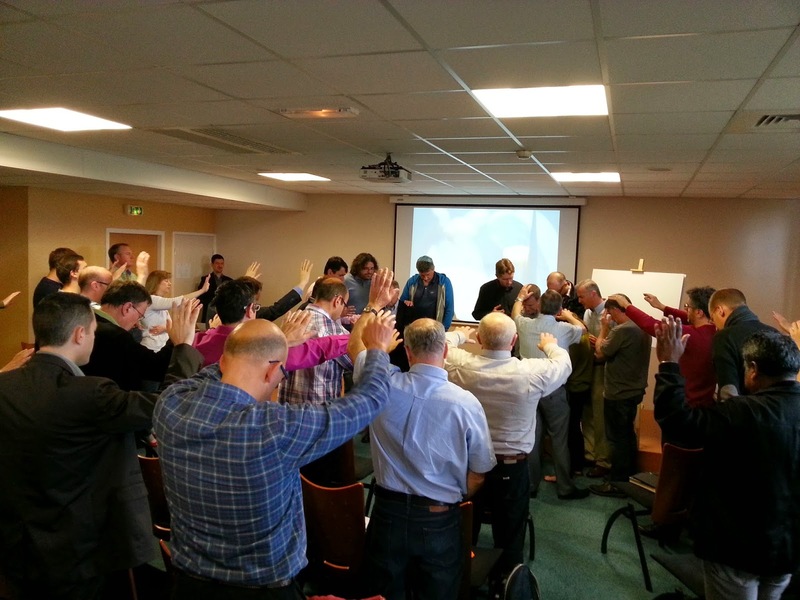 For the second time in a year, teams representing nine different French denominations gathered in the town of Lyon to work collaboratively on the goal of tripling the number of churches in France. The range of theological differences in this group is about as wide as you can imagine–but they are of one mind in essentials and united in their desire to see the country of France reached with the gospel of Jesus Christ. So they resist the urge to debate doctrine, and instead choose to pray together, to confess sin and weakness to one another, to encourage each other, and to work hand in hand for God’s kingdom purposes. The unity that they have built transcends not only denominational differences, but generational differences as well. Older, weary men are daring to believe that, though they’ve not yet seen it in their lifetime, a revival in France may be possible. Young leaders are holding fast to their hope and enthusiasm despite the experience of their predecessors. There was a point during the conference when the older generation expressed their discouragement, lamenting the fact they their labor through the years has resulted in such little fruit. The younger generation came around them in prayer, honoring them for their faithfulness and perseverance. It was a holy moment of reconciliation, as grey haired heroes wiped tears from their eyes and eager young warriors took on the burden of their spiritual fathers with a renewed respect. One theme kept rising to the surface–an unwelcome, disturbing theme. Death. A solemn truth, indeed. Death is no easy thing. Necessary, but not easy. There were no quick decisions. The French wisely count the cost. They analyze, they debate, they question, they challenge. But when they come to a resolution, they stand firm. The resounding resolution was that if a movement is to happen, it will start with those in the room doing the essential things that need to be done. In other words, if I, personally, am not making disciples that make disciples, I have no right to teach my study group or my congregation to do the same. If I am not willing to share the Gospel, I cannot presume to teach a course of evangelism. Ah, but if we do those things, and if they begin to bear fruit, then we can easily inspire and equip others to do the same. And so 45 denominational leaders left the conference with a commitment to do two things, the two things that Jesus commanded his disciples to do. Follow and fish. Over the next six months they will hold each other accountable to do those two things personally. Beyond that, they set hopeful, God-led goals for their denominations. They imagined new possibilities, envisioned new projects, and they made action plans, trusting that the Lord for on-going power and direction. There is a palpable hope for what God has planned, a renewed intentionality about making disciples who make disciples, and a deepened desire to see God’s kingdom established here on earth–because the King is worthy.